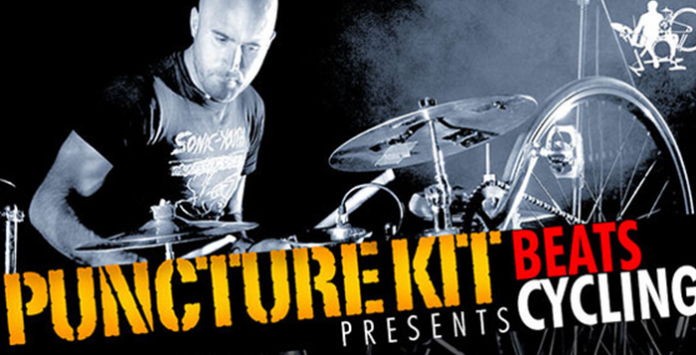 Loopmasters proudly welcome David Osborne with an exclusive set of edgy live beats suited to many electronic styles of music including Dubstep, Drum & Bass, House, Hip Hop, Garage and Breaks. Unless your Bradley Wiggins not many people can say they ride to work on their work, so the idea of mounting an acoustic Drum Kit on bicycle isn’t a thought that enters most peoples head, however Australian Born David came up with the idea whilst fixing a puncture in London’s Green Park, staring at the upturned frame the thought “my drums could fit on there” hit him and Puncture Kit was born. Dave’s unusual drum kit is no gimmick, it is a fully functioning bike and how he transports his gear around he simply rocks up on his bike, unloads the drums, flips the bike upside down and bolts them back on ready to play. Due to the physical size of a bicycle the instruments need to be compact, however the small sizes and quirky percussion pieces happen to create the perfect tones, frequencies and dynamics for the type of sounds found in modern electronic music. A typical Puncture Kit live show could be either David performing solo or an original bass heavy electronic set that travels from Hip Hop, Funk, Jazz, Dubstep, Breakbeat and Jungle using David’s own backing tracks to accompany him. His dynamic performances at festivals, events and private shows have included The 2013 Tour De France, The BRIT Awards after party 2013 at London’s 02 Arena, solo support act for bands such as Florence and The Machine, The Black Keys and Bombay Bicycle Club, The London 2012 Olympic Games Cycling Race and Glastonbury Dance Village and busking to surprised crowds in Oxford Street. Teaming up with Alex Pettman of Debut Audio Mastering, the collection was recorded at Studio 284 in Brighton using a large selection of vintage mics and a whole range of traditional and unconventional techniques to capture the right live drum sound with an edgy modern twist. All manner of tricks and experiments were used including old t-shirts on drums and cymbals to add artificial damping, old cracked cymbals on top of snare drums for trashy backbeats, kick drums stuffed with toys or played with warped skins…anything to replicate and mimic unique electronic drum sounds that could then be played with the real swing of a live drummer. In Detail expect to find 1.7Gb of 24Bit 44.1 Quality Loops including 196 Puncture Kit Loops, 160 Studio Kit Loops at BPMs of 90 to 175 and 751 Multi Velocity Drum One Shots, 12 Puncture Kit fills, 42 Studio Kit fills, 356 Rex2 Files and 4 Soft Sampler Instruments for Kontakt, Halion, Exs24, Nnxt and Sfz formats. Beats Cycling is a diverse set of royalty free samples that draw inspiration from the classic breakbeats featured on many great tracks and includes infectious modern beats made versatile with ambient and close mic-ed variations of both loops and shots. Each sound carefully processed with an all analogue path including classic EQ & compression. So check out the demos and sample Puncture Kit – Beats Cycling TODAY!